They do indeed, and no one else can explain it either, at least not without resorting to Satanic pacts. For the last week, Murphy has more or less been the greatest hitter who ever lived. The NLCS MVP was 9-for-17 over the series, driving in six runs, scoring six times, and boasting an unreal 1.850 OPS. This is, in context, perhaps the single most amazing postseason performance we’ve ever seen, if only because of who’s doing it. Barry Bonds was bananas in 2002; but he’s Barry Bonds. Carlos Beltran was out of his mind in 2004, but that’s Carlos Beltran. 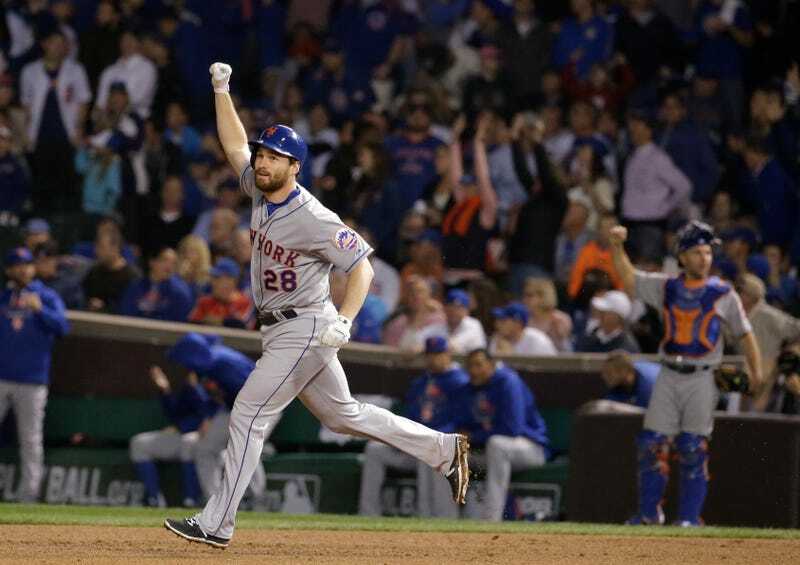 This is Daniel Murphy. A 30-year-old career .288 hitter who had never hit more than five home runs in a calendar month in his life. This patently, objectively, does not make any sense. And there’s nothing to do but keep repeating how it does make any sense, because it’s never going to start making more sense. If you want a partial explanation for Murphy’s success, the Mets’ hitting coaches have been working with him this year on pulling the ball more. Murphy’s always been more of a contact guy than the power hitter some thought he might be, so his coaches figured that if he’s going to put the bat on the ball, he might as well try to put it where he can give it some pop. Indeed all six of Murphy’s homers on his streak have gone out to right or right-center. OK. I’ll buy that that’s something. But Murphy’s bat is hotter than the surface of the sun, to a degree that defies an explanation as simple as a swing adjustment. But that’s the beauty of the postseason, when the last player you’d expect can suddenly become a god for an at-bat, a game, or in Murphy’s case, an entire series-plus. Maybe he’s not fazed by the pressure of the postseason. Maybe it’s a remarkable case of a guy hulking out in his contract year (this playoff run will do wonders for Murphy’s first career free agency, and, ironically, ensure that he’ll cost more than the Mets are willing to pay to re-sign him). Maybe it’s just the laws of probability producing an extreme. I know don’t, and I definitely don’t care. It’s pleasant enough to sit back and just let weirdness keep happening.